Last weekend the kids and I went to a holiday cookie decorating party at our good friends' house. I dislike showing up to a party (or any gathering) empty handed so here was my chance to try something out I had been wanting to make for a few weeks now. I got this idea from Starbucks Peppermint Brownie Cake Pops. The kids and I loved them, but at $1.50 a pop, I knew I could make something like this for far less at home. Probably not exactly like them, but close enough. Press out the air so the bag doesn't pop or explode when you start beating the bag. Grab the rolling pin (or whatever heavy item you so choose) and smash those candy canes. The candy canes don't have to be perfectly crushed. I liked having some really small, fine pieces and then some larger pieces. You may have another method you use for crushing candy canes, but I liked this way. Follow directions on box of brownies - mix in canola oil (or whatever oil you choose), egg, water. Pour into greased pan & bake for 26 minutes at 350 degrees. *This part really depends on which brownie mix you choose or if you have your own brownie recipe. Put a handful of crushed candy cane in the mix and stir. *I did bake them 2 minutes less than the box called (24 minutes rather than 26 minutes) - not that big of a deal and I wanted them to be soft and not cross that line to brownie "rock"
Take the brownies out of the over and let them cool, approximately 15 minutes. Honesty - this is the hardest step ever! I don't have patience for waiting. I want to sample the brownies but they are so darn hot, ouch! Grab small handfuls of brownie and roll into balls. You decide the size. I wanted something a little smaller than donut holes, so that's what I went with. Place on baking pan while you go. Pop into freezer for 1 to 2 hours. Melt almond bark either either in a double boiler or in microwave. You choose. I suggest following the directions on the bag. I haven't had good luck with melting things in the microwave. Timing is not my strength. Maybe you're better at it! I chose double boiler method, but we don't have a double boiler - but I usually get out two smaller pans and put some water in the bottom one. Stir often and stay close by. That's my only hint here - I've learned that from past experience. Too many times I've ruined the melted chocolate process by trying to multi-task. Get the balls out of freezer and get toothpicks ready. Start dipping in the almond bark. You can dip the entire ball in the almond bark for 100% coverage, but on this day, I chose to go with the 75% (ish) coverage. Immediately after dipping the ball into the almond bark, roll it in the crushed candy cane to cover (as much as you can) the white part. Set on wax paper to dry. Repeat steps 8 & 9 for each ball until you have a pile like this. The verdict? I liked them. They were not exactly Starbucks, but good enough for something I made up. Actually, Jill, Christine and Sarah told me they liked them too. Maybe they were just being nice. I guess you'll have to try these out on your own to see what you think! Next time, I may experiment with adding in some frosting into the cooked brownie before rolling into the balls. We'll see! 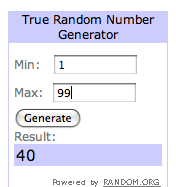 And I do have a winner to announce! Congratulations Elle!!! If you haven't read her blog yet, you should head on over here to do it now! Please email me at runningwiththegirls at gmail dot com with your email address. Email me within 72 hours to claim your prize or I'll have to pick another winner. This looks amazing! 2 of my students are obsessed with candy canes -- I've printed this out and think we'll all have fun making this as a before-school break treat! This looks absolutely amazing... Mmmm..
And I am thrilled to be your winner too. Will email you right away! Thanks so much. Wow! Those look incredible. Maybe I'll make those for my new years eve party! I'm definitely adding these to pinterest! They look AMAZING! Looks yummy, might try them this week with my girls. I'm happy you liked them! Perhaps they will make another reappearance shortly.